Stopping the spread of hazardous waste! Ever-increasing consumption across Europe, coupled with rising prosperity among the populations of the typical emerging economy are causing a sharp upturn in the volume of waste worldwide. The shredding and sorting of rubbish and refuse is one of the key challenges within the waste management cycle. And with ERDWICH shredding machinery and plant, there is a perfect set of solutions for meeting any of these challenges in special waste applications. Flammable & combustible liquids are found in virtually every industrial plant. The quantities of these can vary from a few ounces in aerosol cans to several thousand gallons in bulk storage tanks. The principal hazard associated with storage is the accidental discharge or release of the flammable or combustible material into the surrounding area. Depackage and remove liquids or food stuffs from cans. Pet foods, carbonated drinks, canned vegetables. Depackage cans to recover the contents. 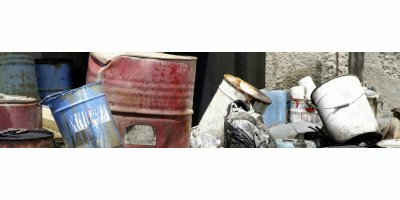 Recovered metal can then be recycled and recovered product can be dealt with Tin Cans, Metal Drinks containers, animal food cans, aerosol cans. Waterborne illness from microbial growth in water distribution systems is a real threat to water safety. MIOX’s patented Mixed Oxidant Solution (MOS) chemistry for secondary disinfection can help eradicate biofilm that can harbor Legionella and other microorganisms without the use of Chlorine Dioxide. MIOX generators improve workplace safety by eliminating the handling and storage of hazardous chemicals while maintaining steady disinfection residuals. By Shanghai CMI Environmental Technology Co.,Ltd. based in Shanghai , CHINA. Removal of urea and phenol formaldehyde resin and fibers from sizing dye operations, particulate and blue haze emissions from fiberglass mat ovens. Removal of styrene emissions from fiberglass composite manufacturing operations. In order to ensure that an industrial process can be controlled or even improved and optimized continually an analysis of the current situation in real time is necessary. Process data like temperature, pressure but also particle concentration and size distribution of a material flow can supply valuable information and be used for the regulation or the improvement of a process. Water is essential for life. It is part of the environment, being used in industrial processes and available as tap water. To secure the safety of water that is daily available, the amount of necessary microbiology tests to comply with regulatory requirements are increasing and are heavily relying on quick and accurate answers to confirm the identities of a broad selection of important micro-organisms. Bins for disposal of empty or partially empty aerosols.